In normal hearts, the upper two chambers (‘atria’) pump blood in a coordinated fashion into the two bottom chambers (‘ventricles’) which then pump this blood to the rest of the body. This relationship is maintained by a regular electrical impulse from the upper chamber (normal sinus rhythm). This usually occurs at the rate of between 60 and 100 beats per minute. In AF, the normal electrical impulse in the 2 atria is disrupted and is replaced by chaotic electrical activity. The atria now ‘fibrillate’ at a rate of 300-400 times a minute and the ventricles follow in a rapid irregular fashion at rates up to 200 beats per minute. For many years, AF was a poorly understood arrhythmia. Now we understand that in most cases, AF is caused by rapidly firing electrical impulses from one or more of the 4 pulmonary veins (PV); the tubes that drain blood from the lungs into the heart (left atrium). 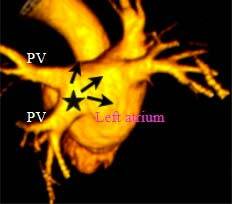 See CT image of the heart for an illustration. What conditions predispose to AF? There are the well-known causes like high blood pressure (hypertension), Ischemic heart disease (‘heart attack’), and diseases of heart valves. These do not account for all cases of AF however, and there is a large number of cases of unknown origin that fall into the category of ‘Lone AF’. We now understand that even ‘Lone AF’ patients have predisposing factors like obesity, obstructive sleep apnoea (excessive snoring during sleep) and borderline high (and hence not treated) blood pressure. It is also notable that AF affects athletes and ‘large people’ (who are not necessarily obese) disproportionately. The precise reasons for this are not clear. Does AF affect heart function? Firstly: AF results in a complete loss of atrial contraction. This means that 2 of the 4 heart chambers do not contribute to the pumping action resulting in a decrease in heart function by almost a third. This causes symptoms of fatigue and shortness of breath. While patients may not notice this reduced heart function when they are resting, they often struggle to cope in periods of increased demand as during exercise. In fact, patients with AF often describe their heart function as ‘an engine that seems to have lost its turbo charger’. Secondly: when the atria do not contract, blood can stagnate rather than moving through quickly. This increases the chance of blood clots forming which in turn can cause stroke. AF increases the risk of stroke 5 fold. In fact, AF is the most common cause of stroke worldwide. Finally: the fast and irregular heart rates caused by AF can wear the ventricles out over time and predispose to tachycardia induced cardiomyopathy. In this condition, the heart muscle itself grows weaker. How does AF behave if left untreated? In many patients, AF occurs initially in an intermittent fashion. In this stage of ‘paroxysmal AF’, patients get spells of AF for a few minutes to hours each time. Patients often experience palpitations during these spells. As these spells are self-limiting, the condition is often difficult to diagnose. The patient may be in normal rhythm when seen by a doctor. His/ her symptoms are often dismissed as being due to anxiety or the like. As the disease progresses, AF episodes gradually become longer and more frequent. The second stage of ‘persistent AF’ is reached when the patient remains in AF all the time. Often this is the stage when the diagnosis is finally made and AF treated with external shock treatment and/or drugs. The time taken to progress from paroxysmal to persistent AF can vary widely and some patient are only diagnosed in the persistent stage due to minimal symptoms. How should my AF be treated? Medication to minimise the risk of a blood clot forming (i.e., stroke) in most patients. This treatment may include Warfarin, or one of a group of newer oral anticoagulants (NOACs, such as Dabigatran, Rivaroxaban or Apixaban) that do not require frequent blood tests for monitoring. An attempt may be made to restore normal rhythm patients in patient who have significant symptoms from AF or who have developed weakening of the heart muscle. This strategy of ‘rhythm control’ may be applicable to the majority of patients with paroxysmal AF and a proportion of patients with persistent AF. In patients with persistent AF, the alternative strategy of ‘rate control’ may be more appropriate. In this; the AF is allowed to continue but it’s harmful effects on heart function are reduced by slowing the heart rate. This may involve placement of a pacemaker in some patients. What are the treatment options for rhythm control? Broadly; AF can be controlled with either drugs, a cardioversion (jump start to the heart with an electrical charge) or ablation (PVI). If you have more questions about atrial fibrillation please phone for consultation with Dr Gomes. Please refer to our Contact page for location closest to you. The information provided on this website is of a general nature and does not replace formal medical consultation. If you are experiencing symptoms it is recommended that you consult a doctor.